MSD Atomic AirForce Intake Manifold - Pann Auto Performance - San Diego largest aftermarket automotive performance parts - What do you drive? When you’re serious about power for your LS or new LT1 engine, call in the AirForce! 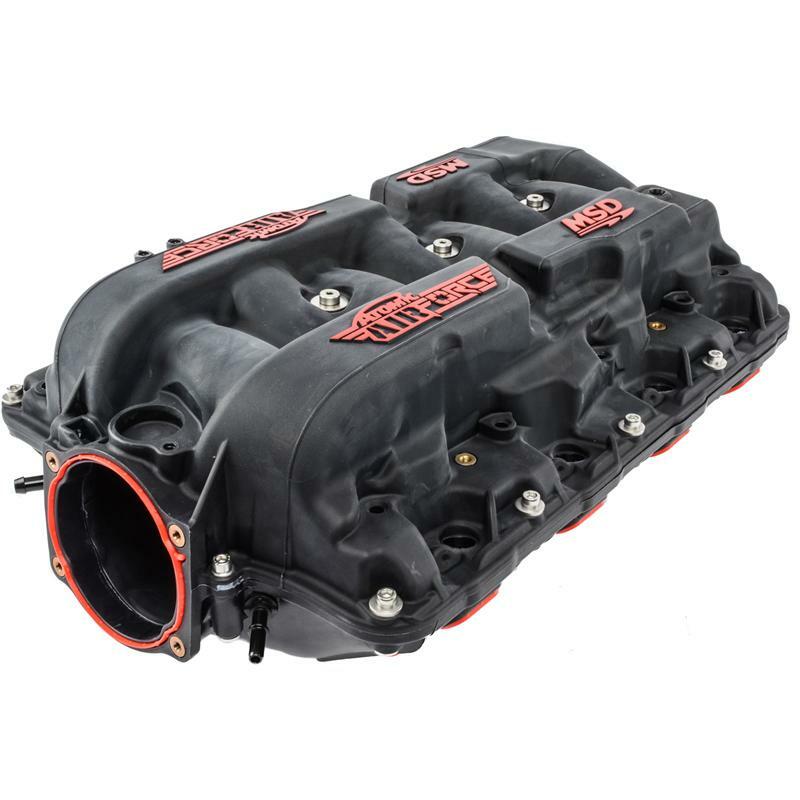 The all-new MSD Atomic AirForce intake manifold delivers improved airflow and distribution to improve the performance of stock and modified engines. The unique bell-mouthed runner entrances maximize airflow and minimize shrouding – all while optimizing the available plenum volume for an unobstructed flow path over opposing runners. The polymer molded 2-piece design allows for easy access to the runners for porting. Atomic AirForce accepts an OEM or 103mm throttle body as well as stock or aftermarket fuel rails^ including MSD’s Atomic LS EFI system. The intake bolts on and is supplied with new gaskets and hardware for a direct bolt-on package. Lingenfelter test shows 36 HP AT THE REAR WHEELS over the competition as tested on a LPE L28 Camaro. Polymer material resists heat soak and minimizes weight. 103mm Throttle bore allows the use of large throttle bodies for greater air flow. Direct flow path runner design promotes maximum airflow. Allows for the use of stock fuel rails,aftermarket rails including the Atomic LS EFI. The two-piece manifold design provides convenient access to the runners for porting. Designed using Computational Fluid Dynamic Modeling to create optimal plenum volume and efficient air flow paths. Models available for LS1, 2, 3, 6, 7, L99 and the new LT1 engine.